What is Dichroic glass and where has it come from? Dichroic glass is a high-tech development from the space industry, first invented to strengthen glass so that astronauts could look out into space by placing a thin layer of various metals inside sheets of glass. This made the dichroic glass strong enough to withstand re-entry into the atmosphere. From the get-go people who worked on the project took pieces home because they were so beautiful and fascinating. Soon, they were adopted for the jewellery industry worldwide. “Dichroic” is defined as the property of having more than one color, especially when viewed from different angles or from transmitted to reflected light. Dichroic glass is produced by a process called “thin film physics” and is generally referred to as a color separator. It is normally used as an interference filter in scientific measuring or correcting applications. Dichroic glass only became available outside of the scientific community a few years ago. Why is Dichroic Glass so strikingly beautiful? Dichroic coatings transmit certain wavelengths of light, while reflecting others, thus creating an interference-effect similar to the iridescence observed in nature’s fire opal, dragonfly wings and hummingbird feathers. 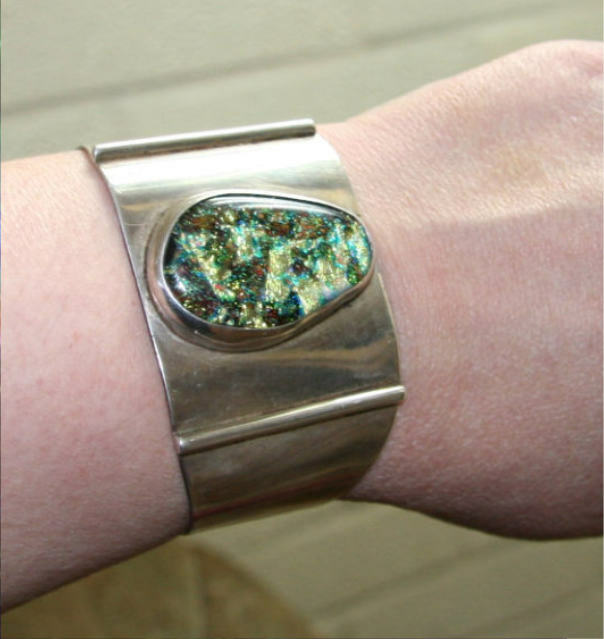 Before dichroic color was developed, there was no man made material which possessed true iridescence. Unlike most objects colors which are created by the use of pigments and dyes, the colors arising from the transmission/reflection separation processes are each of uniform wavelength and thus, they are very pure in frequency, as would be found in a laser beam. Why is the Dichroic iridescence so impactful on the Human Energy System? It is the purity of the light as well as the tremendous range of pure colour energy which causes the colours in dichroic glass to be so super intense, and this is what produces powerful emotional and energetic responses. As the colours are produced as a result of the interactive transmission/reflection process and not because of a fixed pigment, when dichroic glass is viewed at even slightly different angles, the colours change in true iridescence fashion through the range of the rainbow, always retaining that purity and intensity which is the hallmark of the dichroic iridescence. There is a further effect which is related to the fact that looking at abstract art makes you more intelligent - each piece of dichroic glass is a major piece of abstract art in miniature and will trigger areas of the brain not normally used. This also aids in entering into beautiful altered states of awareness easily and naturally. Why are Dichroics so perfect for Energy Magic? Each individual piece of dichroic glass is absolutely unique. Although the original dichroic coating is produced under strictly controlled conditions to create these effects, when the coating is melted into the glass, it bubbles randomly and becomes completely unique for each and every piece at that moment. 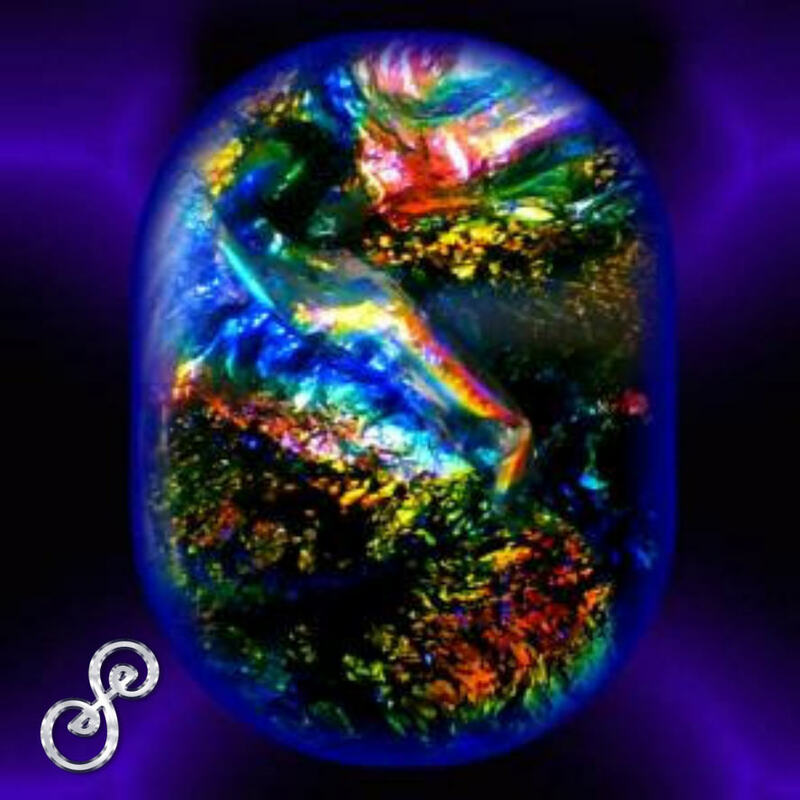 This structural uniqueness allows for an Energy Magician to work with the dichroic cabochons innate qualities, strengthen and align them, and build from these qualities an absolutely unique broadcasting device that is an existence across the levels - one of the most unique and precious objects available in magic. The transmission/reflection qualities of the dichroic glass produce an energetic effect of both being able to absorb energy, as well as emit energy from and into itself, thus being able to both remove unwanted energy from the users system, as well as to add new and extra energy which is needed in a highly complex and subtle, yet powerful energetic event. What is the Dichroic Song? Each dichroic dabochon has a unique combination of colour and energy emission/absorbtion events within its very structure. Even as the colours/energies shift and change through the iridescence effect, each piece has therefore its very own song of colours - "the dichroic song" at the core of each one, with the iridescence representing cadences, variations and harmonies on the central theme. It is that core "dichroic song" of each and every unique piece which calls to a specific human being and how we know who needs which one. How do you awaken the Dichroic Song? These catalysts are very specifically made by humans for humans, to aid humans in their personal development. The fact that dichroic glass is man-made sets this intention right from the beginning very powerfully and makes using these catalysts a very different experience than working with natural emitters such as crystals. Each individual catalyst has been personally activated, named, dedicated and priced one at a time by a member of the Sidereus Team, in keeping with the correct procedure and ceremony for this task, to become a highly specific catalyst for human use in personal development. During the ceremony, each member of the team of activators chose their own catalysts to bond with, to awaken and to dedicate. The original activator hand wraps their own catalysts and sends them personally to the new owner of the catalyst. This is a very important part in the energetic process of transferring ownership of this one particular catalyst from this one particular activator to this one particular new owner - a highly individualised process every step of the way. Once the catalyst is in the hands of the new owner for whom it was destined, it becomes theirs and only theirs, for life. How do you choose your dichroic catalyst? It is important to remember that one purchases not a random "one size fits all" energy magic object, but a highly specific energetic entity and energy emitter/absorberwhich is designed to be the "perfect fit" for the needs of one particular person's energy system. Dichroic catalysts are unsuitable for persons who are unable or unwilling to learn about, understand or work with energetic realities and intention. An individual choosing a particular activator must do so by feeling an unusually strong attraction to the catalyst. This is a kinaesthetic event, a full body desire, a "choosing of this ONE above all others". Or you could call it "falling in love" with that one specific dichroic catalyst; this is exactly what happens in structure. You must KNOW that this is the right catalyst for you. How do I care for my Dichroic Catalyst? - At the physical level, the cabochons are made of glass. They are thereby quite strong and immune to most acids, for example; however they will scratch and may shatter if not treated with the usual respect . - Unlike crystals, once the catalyst has been through the activation procedure, their identity is set once and for all. They can thereby not be re-programmed, de-programmed or spoilt by the influence of others and have an extremely solid energetic identity. - We do not recommend turning dichroic catalysts into jewellery. Although this may help to keep them close by, it means that they cannot be handled, held and placed with full flexibility any longer; the restriction of any metal banding also interferes with their very nature. For purely ornamental purposes, dichroic jewellery can be purchased elsewhere. - Dichroic catalysts are deeply personal and should not be passed on to another unless circumstances are extreme or unusual. If a catalyst is no longer required, it may be given to a river, the sea or otherwise "returned to source" in a suitable ceremony. * Note: This article was accompanying energy magic imprinted dichroic catalysts which were the result of an energy magic research project in 2003-2005. At the time, we had a number of magic jewellery items made featuring imprinted dichroics for sale, such as this one, which is one of my own. I have had this for 13 years now and can attest that it is a truly wonderful thing. I cannot begin to count the times it has been of significant help to reduce stress and keep my energy up in many challenging situations. Other people who have these have said the same, and so we hope one day to bring them back. If you know a silversmith in the UK who would be willing to work with us (we are in East Sussex and would prefer someone we can meet in person), please tell them to contact us. In the meantime, enjoy dichroics and pay attention to them. They are truly magical and a merging of human doings with actual nature that for once, turned out spectacularly well.